United Yacht Sales New Jersey would love to guide you through a personal showing of this 92' Cheoy Lee 92 Sport Motor Yacht 1999. This yacht for sale is located in Fort Lauderdale, Florida and priced at $1,725,000. For a showing please contact us by filling out the form on this page and we will get back to you shortly! Sleeps 8 to 9 guests. There are 4 owner and guest staterooms en-suite, each one with its own full bathroom inside each stateroom. There is an additional stateroom with its own full bathroom for a guest or crew located forward of the bridge. 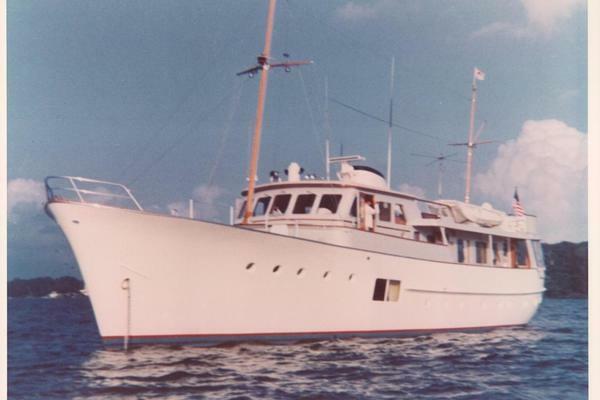 Galleymaid Delta heads fresh water flush, Central Vacuum system throughout, YOLY is beautifully decorated with Mahogany wood and Sapelle Pomelle (burl) wood, accents and elegant furnishings. Frigidaire Gallery edition stainless steel dishwasher, Frigidaire Gallery edition microwave, Frigidaire Gallery Professional Series Refrigerator (24 cubic ft) with freezer/icemaker/water dispenser. Frigidaire Gallery Professional Series Stove, Franke sink with garbage macerator, Black and Decker Toaster oven and extensive cabinet and drawer storage areas. The Genuwood floors in the galley extend forward to the breakfast area on the starboard side and the pilothouse on the port side. The Master Stateroom is accessible by way of private stairway leading from the Main Salon. The stateroom features a king size bed with ample storage beneath. Additionally, there are two chests of drawers as well as extra closet space for bulkier items; a cedar-lined hanging closet and a table/desk. Inside the desk is a vanity area with a braced lift up top complete with light. The wood matches throughout the room. There are separate his and her master bathrooms which include a full-size Jacuzzi with shower in hers and a stall shower with polished stainless steel mirrored ceilings in his and marble counter tops with drop-in sinks in both. The floors are marble with inlay tiles and the walls elegantly papered. Galleymaid Euro heads. A water tight escape door leads into the Engine Room. The Master Stateroom includes an entertainment center with stereo, Sony Trinitron TV, Panasonic DVD/CD player and a Yamaha Natural Sound AV Receiver. There is a full size washer/dryer stack unit located outside the Master Stateroom door. Conveniences and touches include: automatic emergency rope lighting, indirect floor and ceiling lighting, opening portholes and Hunter Douglas Duette shades. New decorative window liners were installed and all the bed comforters and matching decorative pillows have been replaced throughout the Master and Guest Staterooms. Headphone jacks for A/V system, and separate A/C controls, smoke alarms are found in all the rooms throughout the vessel. The carpeting was replaced in the master and all the guest staterooms. The VIP Guest Stateroom is accessible from the salon via a stairwell which leads to all three guest staterooms. This stateroom features an island queen bed (new mattress) with storage drawers underneath as well as night stands. Additional storage includes a cedar lined hanging closet and several drawers. There is an entertainment center with a Toshiba TV/DVD and Yamaha Natural Sound AV Receiver. The ensuite bathroom boasts a Jacuzzi style tub/shower combination. There are granite floors, Vitricore walls and cabinets, Corian counter tops with drop-in sink and gold/crystal faucets. This port side stateroom features a queen bed (new mattress) with storage drawers underneath, a night stand, cedar lined closet and dresser and an entertainment system. The Shower has polished stainless steel mirrored ceilings, marble floors, Corian countertop, and Vitricore walls. This stateroom features twin size berths (new mattresses) with large storage drawers below, a cedar lined closet and a Toshiba TV/DVD and Yamaha Natural Sound AV Receiver. The bathroom has a polished stainless steel mirrored ceiling, marble floors, Corian countertop with drop in sink, Vitracore walls and a full sized stall shower. An office with desk/lounge/laundry area is accessible from the pilothouse. There is a Panasonic Omnivision TV and a Sony car radio for entertainment. A convertible bunk with privacy curtain allows this area to be used as a crew/nanny stateroom. A full-size Kenmore stacked washer dryer is located there as well. The forward stateroom has a double bed (new mattress) with large storage drawers underneath and cedar lined closets. The bathroom has mirrored ceilings, Corian top with drop in sink, Marble floors, Vitricore walls/cabinets and a large shower stall. There is an emergency escape hatch above the bed. To starboard there is a single berth stateroom (new mattress), with storage underneath, night table, cedar-lined closet and ensuite bath with mirrored ceilings. Corian top with drop in sink, marble floors, vitracore walls and cabinets, stall. There are two seating areas both with L shaped couches (storage under). The large table and seating area can seat 10-12 comfortably. The sink runs hot and cold and there is a refrigerator/icemaker. Forward is the helm station with matching controls from below and 2 Stidd helmsman's seats. Some of the controls included are auto pilot, depth sounder, radar, GPS and VHF radio. 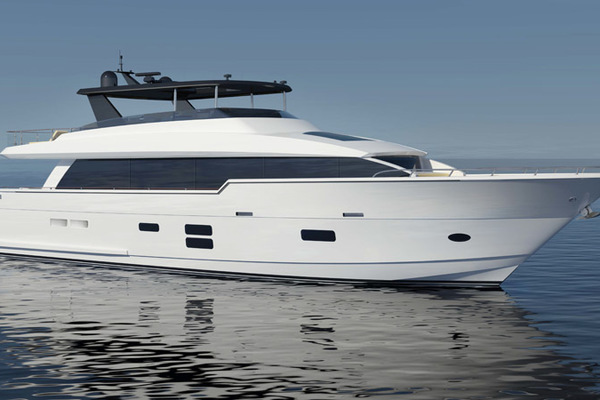 The flybridge's hardtop blends into the radar arch. Aft on the flybridge is the davit for the tender capable of lifting 1500lb. The Hydraulic hoses have just been replaced on the davit hydraulic pump. There are two life rafts with hydrostatic releases and cradles, a 10 man Zodiac and a 6 man Zodiac, two life rings have strobe lights attached and there is an EPIRB. The open covered aft deck features a bench seat with a custom made Teak Table: 42" x 90" with double border on 8" mirror polished stainless steel pedestals (flush mount to deck). The table seats 10 comfortably. The table is an upgrade. There are a total of 5 teak chairs and 2 footstools on the aft deck. Access to the flybridge is by ladder and hatch. There is a good amount of storage under aft deck seating; this is where the life jackets are stowed. The Anchor system has been upgraded from a single 2000lb windlass to dual 2000/2500lb units. All the associated hardware was changed at the same time. A large sunning area can accommodate 6-8 comfortably on cushions. The bow sunning area can be shaded by a removable awning. There are two plough anchors in the most forward hatch. The Hardwired Remote control allows one to control the engines from the bow, stern or aft of the flybridge. Stern shore cable, TV & shore power inlets, interior & exterior 24 VAC lighting by DR Smith. Door & hatch alarm system, automatic emergency lighting system, central bonding system with hull mounted zincs, Dynaplate ground for electronics panels, Smart Y twin 50 amp/100amp adapter, 220 VAC 100 amp 60 Hz shore system, 120 VAC 60 Hz, 24VDC, 12VDC. Hand held remote engine control and bow thruster panel by Twin Disc with three stations. The main propulsion is via two Caterpillar 3412 engines with ZF gearboxes. The Engines have around 470 hours since a major overhaul by an authorized Caterpillar dealer with paperwork available. Total engine hours are only 4,300. The Engine Room has a sink and freshwater hose, air compressor and blackwater tank sentry with high level alarm. A fuel transfer system with Rate Aid Meter allowing for transfer of fuel to and from all 5 fuel tanks. Twin Disc Electronic Engine Control with handheld remote. Twin Marine Air Chiller Units connected to all the interior air handler units. Spare D8 gel battery housed in an easily accessible custom case located in the engine room. New Mufflers/Mixers on both port and starboard exhausts. Powder coated (white) deck plates throughout E/R. Stainless steel drip trays under engines; 250 gallon black water tank with macerator pump to overboard or deck pump out; lube oil change systems all engines. The engine room has sink and fresh water; hose bib, fuel, water, black & gray water tank gauges, pneumatic type. Dual intake blowers via Munter type air vents hull side with automatic fire dampers. Fuel transfer system to all tanks & fuel transfer pump and rate aid meter system. Twin Disc electronic engine control with hand held remote. All batteries onboard are Exide Gel batteries. Two sets of 24V 220 amp per hour banks for main engine starting and ships service. Also two sets of 12V 175 amp hr battery banks for generator starting. A 60 amp charger and a 20 amp charger service the battery banks. Shorepower is handled via a 24V dc Glendenning cable with 125ft electrical cable master. A smart Y twin 50 amp/100 amp adapter (splitter box) will work where there is no 100 amp shore power available. There are two Northern Lights Generators onboard a 32kW (6,225 hours) and a 40kW (7,470 hours). Both generators are housed in hush boxes. The interior and exterior lighting system is a DRSmith 24 VAC. There is rope lighting throughout the interior of the vessel. An emergency lighting system is in place and automatically activates when necessary. All machinery and equipment are centrally bonded to hull mounted zincs. The electronics are grounded through a Dynaplate located midship on the port hull. Electrical system comprises a 220 VAC 100amp 60 Hz shore system, 120 VAC 60 Hz, 24 VDC and 12 DC. The Bow thruster runs off hydraulics and is tied into the Naiad Stabilizer system. Novurania tender is not included in this sale.